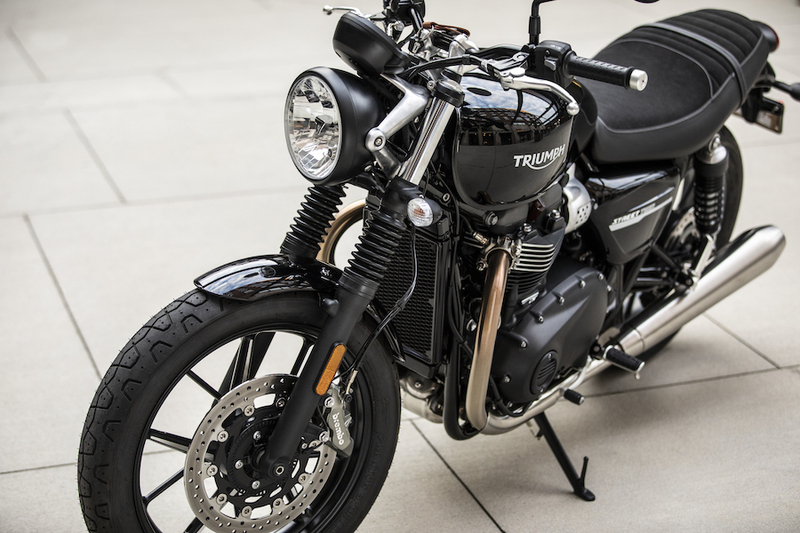 Three years ago Triumph reinvented its entire Bonneville range of retro-inspired twin-cylinder motorcycles, by presenting five new models powered by all-new liquid-cooled parallel-twin engines – the 900cc Street Twin, and four 1200cc big twins. These were joined a year later by a revamped version of the British manufacturer’s existing Street Scrambler, as the second model in its 900cc entry-level lineup. Now Triumph has commemorated the 60th anniversary of its first-ever Bonneville roadbike’s debut at the 1958 Earls Court Show, in belated recognition of Johnny Allen’s September 1956 feat of setting a new World Land Speed record for motorcycles at 214.40mph (345.04km/h) on the Bonneville Salt Flats, by introducing upgraded versions of both the Street Twin and Street Scrambler, which are essentially the entry-level models to its entire range. Almost 18,000 examples of the Street Twin alone have been built and sold in the past three years, making it the British firm’s single best-selling model. The chance to ride both new Triumphs along the shores of the Atlantic Ocean from the resort of Cascais west of Lisbon, before diving inland to the hills and valleys of the Portuguese countryside further north, revealed the noticeable step forward which the new bikes represent over what was already a pretty good dynamic package. But even before that, the subtle updates to the styling – especially on the Street Twin – deserve attention. 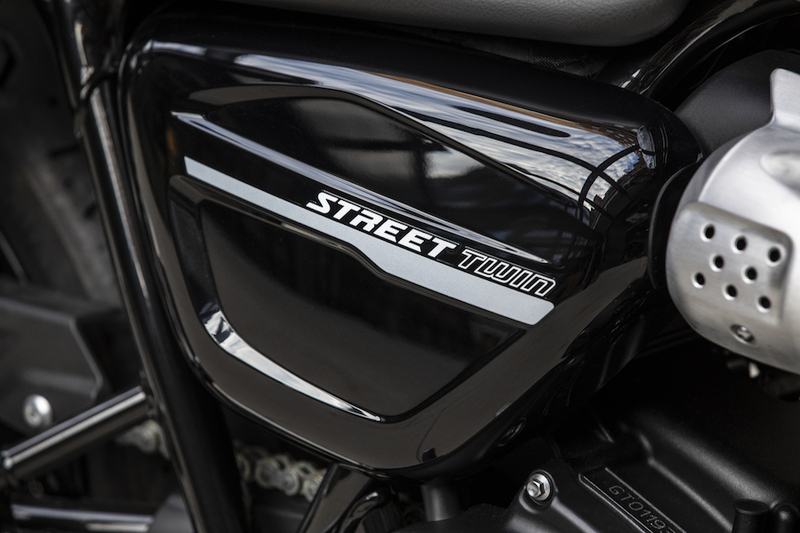 Though a mass-produced product made in its trio of factories in Thailand, the 2019 Street Twin seemingly has an extra level of refinement in its looks that’s worthy of a more bespoke model, especially when viewed in the test bike’s classy looking new Matt Ironstone colour. The latest design of 10-spoke cast aluminium wheels look like they came from the costlier end of the aftermarket, and the new dual seat is equally high end, with contrasting vinyls that look like leather, and prominent stitching. That seat has also been reshaped, and its height raised 10mm to 760mm via thicker foam padding aimed at increasing comfort and long-distance rideability. But because the frame rails are pulled in and waisted just behind the 12-litre fuel tank, it still feels low and thus accessible for shorter riders who’ll welcome being able to place both feet flat on the ground at traffic lights. Yet at 180cm tall I didn’t feel at all cramped, because there’s lots of room to move around the Street Twin. Sitting on it is a nice place to be, with an easy reach forward to the short, flat, one-piece steel handlebar mounted on 60mm risers, with adjustable brake and clutch levers. The riding position is relatively close-coupled without being cramped, and the slightly pulled-back handlebar delivers a very relaxed riding stance. The footrests’ location encourages you to ride with your toes parked on the pegs, and knees tucked in tight to the flanks of the tank – you feel very much a part of the Street Twin, and it’s an untiring ride thanks to the complete absence of vibration at any revs from the revamped parallel-twin motor with a 270-degree crank and dual counterbalancers. 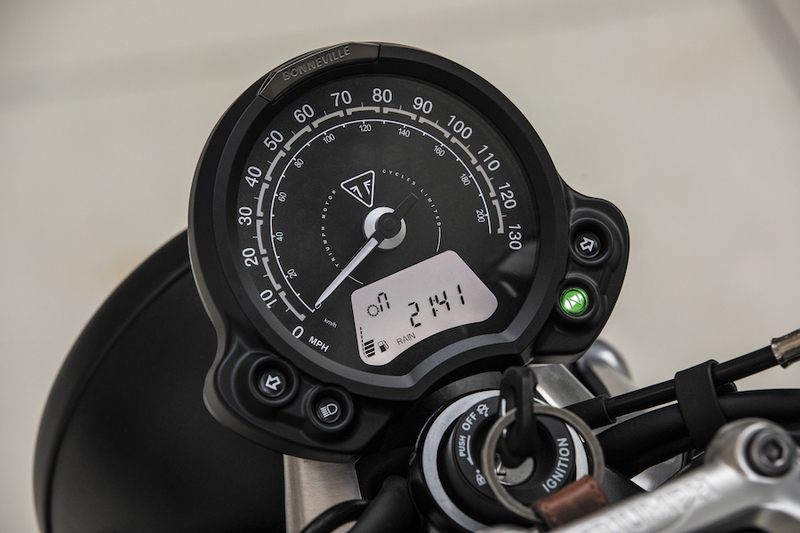 In fact, it’s vibration free right up to the soft initial revlimiter on the ride-by-wire throttle now activated at 7500rpm, which is 500 revs higher than before. The retro-looking round mirrors give a good view, and don’t vibrate either. 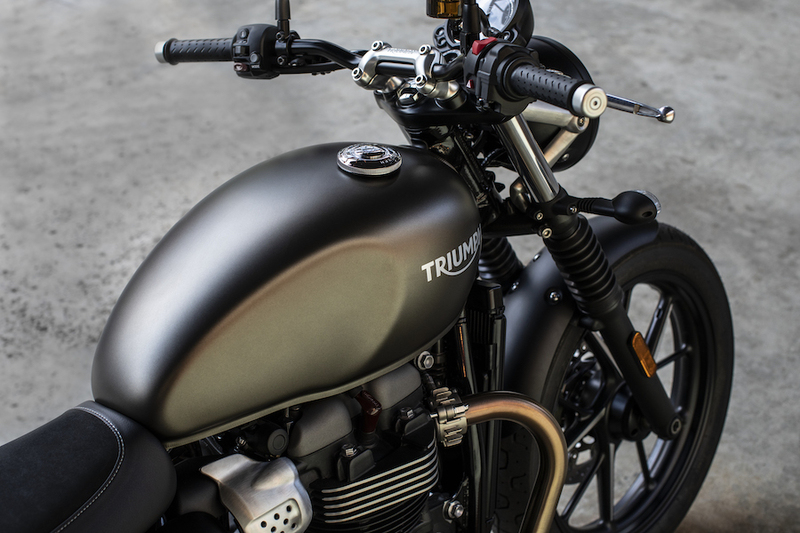 Thumb the clever combined starter button and killswitch to send the liquid-cooled engine into life, and, as it settles to a 1000rpm idle speed you can relish again the glorious lilting note of the stock Street Twin exhaust. Just as three years ago when it was first launched, it seems improbable that Stuart Wood, Triumph’s head of engineering and his men could get such a good-sounding exhaust through Euro-4 compliance – but they did. 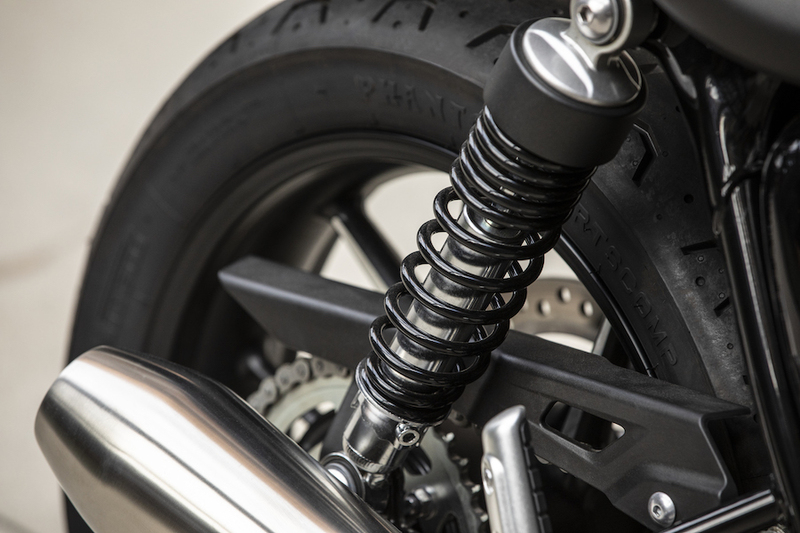 Then savour the extremely light and ultra-controllable lever action of the cable-operated oil-bath slip/assist clutch, which makes riding in traffic or city streets completely untiring. Since its birth exactly 60 years ago in 1958, the Triumph Bonneville is the most iconic streetbike produced by any European manufacturer. The first 650cc T120 Bonneville which began production in 1959 was essentially a 46hp twin-carburettor version of Triumph’s T110 Tiger. It quickly became the must-have motorcycle of the day, backing up its high performance and handsome looks with success on the racetrack, including victory in the Isle of Man Production TT. The Bonneville was the machine of choice for Britain’s café racer Rockers, and anyone else seeking ultimate roadbike performance for the era. It was the two-wheeled star of London’s swinging ’60s scene, as much a part of British pop culture as the Mini, double-decker buses, Twiggy and the mini-skirt. When Triumph went bankrupt and its Meriden factory finally closed in 1983, the youthful property developer John Bloor purchased the derelict factory, which he demolished for his Bloor Homes company to build houses on. But Bloor also acquired the rights to the Triumph name, and while working towards re-starting a new Triumph Motorcycles in nearby Hinckley, he licensed production of the T140 Bonneville to Les Harris’s company Racing Spares, which produced 1200 such bikes between 1985 and 1988.
bu when Triumph re-emerged in 1990, there was no place for the Bonneville in the new line-up. With the reborn manufacturer’s range based around more modern Japanese-style three- and four-cylinder motors, the now outdated air-cooled parallel-twin was consigned to history… or so we thought. For at Intermot 2000 Triumph revived the Bonneville via a classically styled 790cc eight-valve parallel-twin engine with chain/gear-driven dohc, whose wire-wheeled styling paid tribute to the Swinging ’60s. This new version proved a hit with customers of all ages, and 2006 saw engine capacity raised to 865cc. Fuel injection made an appearance in 2008, and the following year the Bonneville was completely revamped, fitted with cast wheels in a tribute to the 70s. 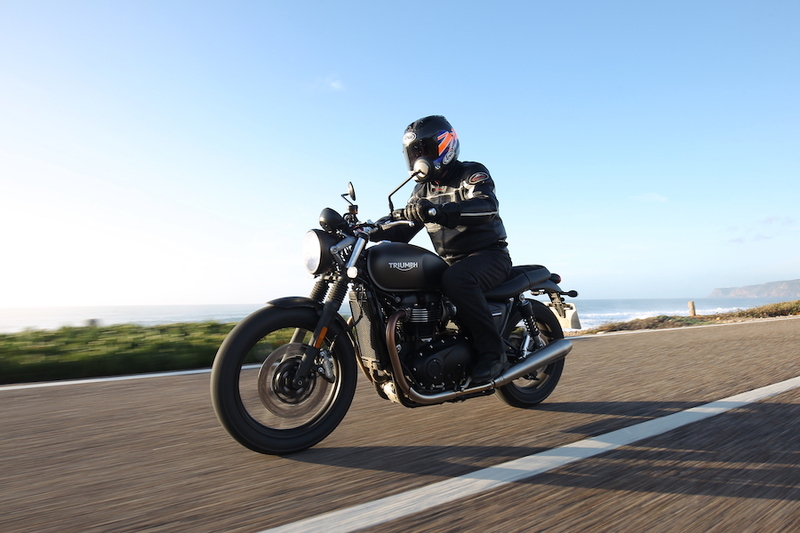 Since then it has become the core component of Triumph’s range, with 141,000 parallel-twins built up to 2016, spread between the Bonneville, Scrambler, T100, Thruxton, America and Speedmaster models, all emanating for the past decade from Triumph’s three factories in Thailand.